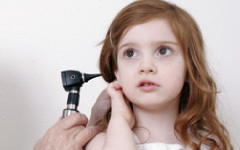 Our physicians are highly trained in diagnosing and treating pediatric ear, nose, and throat disorders. Otolaryngologic disorders, including those of the head and neck, are extremely common in this age group. In fact, approximately 30-40 percent of our practice’s patients are children. At Hunterdon Otolaryngology and Allergy Associates, we have the trained staff, facilities and equipment to treat all areas of pediatric otolaryngology spanning the ears, sinuses, nose, throat, sleep, facial trauma and allergies.